Hey there! Thanks for dropping by aprilslife! Take a look around and grab the RSS feed to stay updated. See you around! On Wednesday night, a new American Idol was crowned. 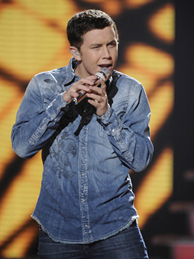 Congrats, Scotty McCreery. But this news was actually anti-climactic compared to everything else that occurred in the 117 minutes leading up to Ryan Seacrest’s big announcement. If anything, there were so many great performances by the contestants who didn’t make it to the finale, it was enough to make viewers wonder if they’d voted wrong when they elected the final two. Perhaps this was not the agenda “Idol” producers had in mind when they planned this show…but their loss was our gain, because we were all treated to a night of fine Idolicious entertainment. Any viewers who saw J.Lo and her admittedly more vocally gifted husband Marc Anthony duet at the 2005 Grammys were probably relieved that J.Lo refrained from singing when Marc performed on the “Idol” finale, instead just doing what she does best: Shaking her famous moneymaker like a Fly Girl. Still, it was a little weird that the singing judge of a singing competition only DANCED, and didn’t bother to come within 10 feet of a working microphone. When an aerial stuntman in Spider-Man spandex, suspended only by skinny strings, hovered above the audience, my heart stopped, imagining another Julie Taymor-style disaster like the “Idol” stage collapsing on top of J.Lo’s million-dollar-insured legs or whatever. But instead U2’s Bono and The Edge, and Turn Off The Dark Broadway star Reeve Carney, performed the musical’s soundtrack single “Rise Above” without a hitch. I would have preferred another Rock Of Agescast performance, myself, but this sounded like a solid U2 ballad, and everyone emerged unscathed, so I was pleased. And relieved. I never thought I’d see the day when Jack Black would be upstaged. But he met his match in Season 10 growler Casey, who out-scatted him on a bizarre but amusing cover of Queen’s “Fat-Bottomed Girls,” while a bunch of modern-day Fly Girls in short-shorts gyrated behind them. It was more like Bodacious D than Tenacious D. It was also pretty awesome. The season’s two young and impressionable finalists probably still wake up with night sweats remembering that time they were locked in a rehearsal room with mentor Lady Gaga and ordered to act “evil” and French-kiss microphone stands. When Gaga hit the finale stage in a metal-studded bikini, rubbing up against “So You Think You Can Dance” allstar Mark Kanemura on a giant rock, then jumping into a hellpit Black Swan-style, it was a tame performance by Gaga standards…but I bet Scotty kissed his cross again anyway. 4) The Great Debate: What Was This Season’s Most Shocking Elimination? He plays the class clown on “Idol,” but never forget Steven Tyler is a ROCK GOD, people. There’s more to him than wacky one-liners, inappropriate flirting, and colorful scarves. His “Dream On” performance was a welcome reminder of his legacy, and on an even happier note, it forever erased Danny Gokey’s infamous “Dream On” Season 8 performance from viewers’ scarred brains. It was beautiful, man. Just beautiful. A couple weeks ago when James was eliminated, I lamented what could have been, imagining “James rocking the stage sheathed in Rob Halfordian leather” on the finale if he’d advanced. But I ended up not only getting my wish…I got James rocking the stage WITH ROB HALFORD. Watching James live out his Beavis & Butthead-esque rock ‘n’ roll fantasies, engaging in a headbanging Judas Priest screech-off on “Living After Midnight” and “Breaking The Law” (as “Pepsi Moment” pyro flames shot up to the ceiling and James’s tail-scarf wagged in earnest) was such a righteously rawkin’ antidote to the scrubbed-cleaned final two’s safe, grandma-friendly performances. And did James borrow that studded vest from Gaga? KARACHI, Pakistan – Pakistani commandos regained control of a naval base Monday from a team of Taliban militants who attacked then occupied the high-security facility for 18 hours — an exceptionally audacious act of insurgent violence that dealt a humiliating blow to the military. The attackers — thought to number around six — destroyed at least two U.S.-supplied surveillance planes and killed 10 security officers, officials said. At least four of the attackers were killed, and two others may have escaped, said Pakistan Navy chief Nauman Bashir. The Pakistani Taliban claimed responsibility for the assault in the city of Karachi. The militants said it was revenge for the May 2 American raid that killed al-Qaida chief Osama bin Laden, and the insurgents were under orders to fight until the death. “They do not want to come out alive, they have gone there to embrace martyrdom,” said spokesman Ahsanullah Ahsan. The insurgent team armed with grenades, rockets and automatic weapons stormed Naval Station Mehran under cover of darkness late Sunday, using ladders and cutting the wire to get into the facility, Interior Minister Rehman Malik said. Once inside, they scattered around the compound, setting off explosions and hiding in the sprawling facility. During the day Monday, the militants were holed up in an office building in a gunbattle with commandos, navy spokesman Irfan ul Haq said. Navy helicopters flew over the base, and snipers were seen on a runway control tower. By the afternoon, Haq said the militants had been defeated. “Thanks be to God, the base is cleared and the operation is over,” he said. Commandos leaving the complex flashed victory signs to reporters. Six Americans and 11 Chinese aviation engineers were on the base but escaped unharmed, he said. The insurgents’ ability to penetrate the facility rattled a military establishment already embarrassed by the unilateral American raid on bin Laden and raised the possibility they had inside help. It will also likely lead to more questions over the safety of Pakistan’s nuclear weapons. In 2009, Islamist terrorists stormed army headquarters close to the capital, holding hostages for 22 hours. But unlike the attack Sunday in Karachi, the attackers then failed to deeply penetrate the complex. 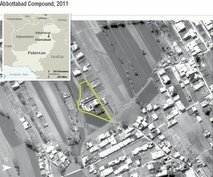 The unilateral U.S. raid on bin Laden’s compound in the northwest Pakistani garrison city of Abbottabad has triggered a strong backlash against Washington, as well as rare domestic criticism of the armed forces for failing to detect or prevent the American operation. Pakistani leaders insist they had no idea the al-Qaida boss had been hiding in Abbottabad. This is the third major attack the group has claimed since the bin Laden killing. The others were a car bombing that slightly injured American consulate workers in the northwest city of Peshawar and a twin suicide attack that killed around 90 Pakistani paramilitary police recruits. At least two P-3C Orions, maritime surveillance aircraft given to Pakistan by the U.S., were destroyed, he said. The U.S. Navy puts the cost of the planes at $36 million each. The United States handed over two Orions to the Pakistani navy at a ceremony at the base in June 2010 attended by 250 Pakistani and American officials, according to the website of the U.S. Central Command. It said by late 2012, Pakistan would have eight of the planes. U.S. Embassy spokesman Alberto Rodriguez said the Americans were working as contractors to help support the P-3C aircraft but did not report to the U.S. Embassy or Consulate. Four of them were part of a Lockheed Martin contract engineering and technical support team, he said. Karachi, a city of around 18 million people, has not been spared the violence sweeping the country, despite being in the south and far from the northwest where militancy is at its strongest. In April, militants bombed three buses taking navy employees to work, killing at least nine people. The Pakistani Taliban and other militant groups have little direct public support, but the army and the government have struggled to convince the people of the need for armed operations against them. The militants’ identification with Islam, strong anti-American rhetoric and support for insurgents in Afghanistan resonates with some in the country. Also Monday, Pakistani intelligence officials said a pair of suspected U.S. missiles hit a vehicle and killed four people near the Afghan border. It was the latest in an uptick of strikes following the bin Laden raid. The attack occurred in Machi Khel area in North Waziristan, a tribal region home to several militant groups attacking U.S. forces in Afghanistan. The U.S. relies heavily on missile strikes to target foes in Pakistan. Pakistan objects to the attacks publicly, but is believed to support them in private. The two officials spoke on condition of anonymity because they were not authorized to talk to reporters. They said they did not know the identities of the people killed. Associated Press writers Ishtiaq Mahsud and Rasool Dawar in Dera Ismail Khan contributed to this report. KIRKUK, Iraq – A triple bombing killed 27 people and wounded scores outside a police station Thursday, heightening tensions in a northern Iraqi city already on edge after a string of kidnappings and attacks against security officers. The new violence adds to strain that already besets Kirkuk, a city that has long been plagued by ethnic squabbles over land and oil fields. Iraqi and U.S. officials long have feared Kirkuk and the disputed lands surrounding it — sandwiched between Arab villages and an autonomous Kurdish region — could destabilize the country if American forces leave at the end of this year on schedule. The first blast, a bomb stuck to a car in a parking lot in central Kirkuk, lured policemen out of their fortified headquarters to investigate around 9 a.m., said police Capt. Abdul Salam Zangana. Three minutes later, a second blast rocked the lot when a car packed with explosives blew up in the crowd of police. The third bomb, planted on a road leading to a hospital, set cars and trucks ablaze when it exploded about 550 yards (500 meters) away less than an hour later. Zangana said it targeted a police patrol near a mosque. Located 180 miles (290 kilometers) north of Baghdad, Kirkuk has been an ethnic flashpoint for years among Kurds, Arabs and Turkomen, who each claim the oil-rich city as their own. Kirkuk’s two largest ethnic groups have their own competing security forces — the Arab national police and the predominantly Kurdish peshmerga forces — and that division has stoked tensions. Within the last 10 days alone, police patrols in Kirkuk have been targeted in five roadside bombings and an Iraqi army base has been hit by two Kaytusha rockets, said city police Col. Sherzad Mofari. In Mosul, another major city within the disputed territories, four Iraqi army soldiers were killed by a roadside bomb Thursday afternoon, a policeman said. Also, Kirkuk kidnappers also killed a policeman and a Christian construction worker. The latter was dismembered after his attackers gave up on collecting the $100,000 random they had demanded. Mofari blamed the violent upsurge on al-Qaida and its allies in Iraq, which seek to stir up Kirkuk’s tensions. “They are trying to keep this instability of security in the city for a long time,” he said. American military commanders have long worried that the simmering fight over Kirkuk could provoke violence that could spread to the rest of the country. For the last several years, U.S. troops have worked to build partnerships between Iraqi army forces and the Kurdish security forces, known as peshmerga, to secure the swath of disputed lands that stretches over three northern Iraqi provinces — and over some of the world’s most lucrative oil reserves. But as the U.S. troops withdraw, there is little indication the Kurdish-Arab partnerships will hold, and officials gloomily predict they could return to violence if the Americans leave as scheduled on Dec. 31. In February, for example, the Kurdish government sent thousands of peshmerga around Kirkuk, claiming to be protecting the city from planned demonstrations that might turn violent. But the incursion scared Arab and Turkomen residents, who called it a thinly veiled attempt to surround Kirkuk with Kurdish forces. The peshmerga pulled back a few weeks later and the crisis passed without bloodshed. In Baghdad, lawmakers are still haggling over rules for taking a national census that that would determine Kirkuk’s residency — and therefore which ethnic group can rightfully claim power — trying to shape the eligibility requirements to best suit their constituents. Hours after the bombings, the U.N. envoy to Iraq, Ad Melkert, called on all sides to quickly settle the disputes to prove that Iraqi leaders want to ensure security and stability across the country. The U.N. has been working with Kirkuk’s leaders for years to settle the dispute over the territory and get the census taken, but few believe it will be resolved any time soon. At one hospital where victims were taken, some said they were close to giving up hope. “This is because of carelessness of security,” said Awaz Kamal, 45, crying as she watched her son, policeman Saman Salih, being prepared for an operation to remove shrapnel from his stomach. Around them, bloodied and bandaged victims lay on the floor, because the beds were already filled with patients. Then a police truck pulled into the hospital driveway with four bodies lying motionless in the truck bed. It was not clear whether they were alive or dead. Jakes reported from Baghdad. Associated Press writers Hamid Ahmed and Rebecca Santana also contributed. KABUL, Afghanistan – Hundreds of protesters, angered by an overnight NATO raid that they believed had killed four civilians, clashed on Wednesday with security forces on the streets of a northern Afghan city. Eleven people died in the fighting, government officials said. The demonstrators fought with police and tried to assault a German military outpost in the city of Taloqan, the capital of Takhar province, the officials said, adding that some 50 were injured. The protest was triggered by an overnight NATO raid on the outskirts of the city. The coalition said four insurgents died in the operation and that two others were detained. Night raids targeting insurgents regularly stir up controversy in Afghanistan, where angry residents often charge the next day that international forces go after the wrong people or mistreat civilians as they search compounds. Success by NATO in reducing civilian casualties and agreements to conduct night raids alongside Afghan forces have not managed to stem the tide of accusations. Adding to the confusion, it is often difficult to know who is a militant in insurgent-heavy areas, where entire villages are often allied with the Taliban or other groups. On Wednesday, hundreds of people gathered on the road from Gawmal to Taloqan and carried the four bodies — two men and two women — on platforms as they marched into the city. They shouted insults at Afghan President Hamid Karzai and the United States as they pumped their fists in the air. “Death to Karzai! Death to America!” they yelled. Officials estimated there were about 1,500 demonstrators. The crowd started looting shops and throwing stones at a small German base in the city. Police were out throughout the city trying to calm the crowd, Taqwa said. Gunfire could be heard in a number of neighborhoods and troops at the German outpost shot off rounds in an attempt to disperse the crowd outside their walls. The German military said in a statement that the demonstrators threw hand grenades and Molotov cocktails into the base, injuring two German soldiers and four Afghan guards. The German soldiers, one of whom was lightly injured and one somewhat more seriously, were both in stable condition, the military said. At least 11 protesters were killed in the fighting, and 50 people were wounded — some of them police officers, said Faiz Mohammad Tawhedi, a spokesman for the Takhar government. The raid late Tuesday killed two men and two women who were inside a home in an area known as Gawmal, provincial Gov. Abdual Jabar Taqwa said. He said that no one in his government was informed about the raid and that NATO acted unilaterally. Provincial police chief Gen. Shah Jahan Noori said he had not been informed of the operation and said none of his officers were involved. Army officials could not be reached immediately for comment. NATO confirmed it killed four people, two of them women, but said all were armed and tried to fire on its troops. One of the women was armed with an assault rifle and tried to fire on the troops, NATO said. The other woman was armed with a pistol and pointed her gun at the security force as she was trying to escape the compound. It is rare for women to be part of an insurgent fighting force in Afghanistan, but not unheard of. There have been cases in the past of women fighting with the insurgency, including as suicide bombers. NATO said the raid was conducted by a “combined Afghan and coalition security force” and an alliance spokesman said that the governor was contacted ahead of the raid. “It is standard practice in Takhar province to contact the Afghan provincial leadership prior to an operation. In this case, calls were placed to the provincial governor six times prior to the operation,” Maj. Michael Johnson said. “We are aware of the claims of civilian casualties, and are looking into them,” Johnson added. President Hamid Karzai sided with the Afghan officials. He issued a statement condemning the night raid as having killed four members of a family, and said it was not coordinated with Afghan forces. “Despite repeated warnings that have been issued by President Karzai to top these uncoordinated NATO operations, it seems these types of operations still have not stopped,” Karzai’s office said in a statement. He said the Afghan people should protest without turning to violence, but also said that the blame for the protest lies with NATO. NATO said that the raid targeted a man working with the Islamic Movement of Uzbekistan — an insurgent group that is powerful in the north. The man was involved in arms trafficking and building explosives, NATO said. The alliance did not say if he was killed or captured. In the south, meanwhile, a NATO service member died Wednesday in an insurgent attack, the military coalition said. NATO did not provide further details or the service member’s nationality. ISLAMABAD – According to a joint statement, the U.S. and Pakistan have agreed to work together in any future actions against “high value targets” in Pakistan. The two countries made the announcement Monday following a visit by U.S. Sen. John Kerry to Islamabad. Kerry is the chairman of the Senate Foreign Relations Committee. Relations between the two countries have been badly strained following the U.S. Navy SEAL raid that killed Osama bin Laden on May 2. U.S. officials have said they didn’t tell Pakistan about the operation before it happened, because they were worried bin Laden might be tipped off. ISLAMABAD (AP) — U.S. Sen. John Kerry says he and Pakistani leaders have agreed on a “series of steps” to improve their nations’ fraying ties. Kerry was in Pakistan on Monday amid high tensions over the U.S. raid that killed Osama bin Laden in the South Asian country’s northwest. Pakistan says the raid violated its sovereignty. Kerry insists the secrecy surrounding the May 2 raid on bin Laden was crucial to assuring its success, and that he himself did not learn of it until afterward. BEIRUT – Syrian security forces opened fire on thousands of protesters Friday, killing at least 13 people, wounding hundreds and forcing residents to turn mosques into makeshift hospitals in a southern city that has become a flashpoint for anti-government demonstrations, witnesses said. The government acknowledged violence in Daraa, but said only two people died and blamed armed thugs. One witness said he helped ferry the dead and wounded to the city’s hospital, where he counted 13 corpses. “My clothes are soaked with blood,” he said by telephone from Daraa, adding that he was among thousands of people at the protest and he witnessed security forces shooting live ammunition. Like most activists and witnesses who spoke to The Associated Press, he requested anonymity for fear of reprisals. A nurse at the hospital said they had run out of beds; many people were being treated on the floor or in nearby mosques. Protest organizers have called on Syrians to take to the streets every Friday for the past three weeks, demanding reform in one of the most authoritarian nations in the Middle East. The protests have rattled the regime of President Bashar Assad, whose family has ruled Syria for nearly 40 years. The witness accounts coming out of Syria could not be independently confirmed because the regime has restricted media access to the country. Human rights groups say around 115 people have been killed in the security crackdown. Witnesses in several other cities across Syria also reported protests Friday. An eyewitness in the coastal city of Latakia said hundreds of people took part in a largely peaceful protest Friday calling for political freedoms. “Peaceful, peaceful!” they shouted, marching past soldiers who were deployed in force in and around the religiously mixed city where clashes two weeks ago killed 12 people. He spoke on condition of anonymity for fear of reprisals. Activists said protests also erupted in the central cities of Homs and Hama, the coastal city of Banyas, the northern city of Aleppo and outside the capital, Damascus. A video posted by activists on Facebook showed a crowd of people in the Damascus suburb of Harasta shouting “We want Freedom!” and “The Syrian people will not be humiliated.” The footage could not be independently confirmed. The state-run News agency said a police officer and an ambulance driver were killed Friday in Daraa. The report blamed “armed men” for the violence. The government has blamed much of the unrest in recent weeks on armed thugs. It was not clear if SANA and the eyewitness were counting the same people. The Interior Ministry called on residents of Daraa not to provide shelter for the armed groups that opened fire on civilians and police and to provide authorities with any information they have about them. Syria had appeared immune to the unrest sweeping the Arab world until three weeks ago, when security forces arrested a group of high school students who scrawled anti-government graffiti on a wall. Protests then exploded in cities across the country. Daraa is parched and impoverished, suffering sustained economic problems from a yearslong drought. Assad has made a series of concessions to quell the violence, including sacking his Cabinet and firing two governors. On Thursday, he granted citizenship to thousands of Kurds, fulfilling a decades-old demand of the country’s long-ostracized minority. But the protest Friday in Amouda — a Kurdish city — suggested the population still was not satisfied. An activist in Douma, a Damascus suburb where at least eight people were killed during protests last Friday, said he was expecting a large turnout Friday. Hundreds of activists and residents have met this week to prepare for the demonstration. But telephone lines to Douma appeared to be cut Friday. Activists in Damascus, quoting people who came from Douma, said thousands of people were demonstrating outside the suburb’s Grand Mosque. Despite the regime’s gestures, many Syrian activists remain skeptical about the regime’s concessions and have called for much more concrete reforms, such as lifting the state of emergency, which has been in place since 1963 and gives the regime a free hand to arrest people without charge. AP writers Zeina Karam in Beirut and Elizabeth A. Kennedy in Cairo contributed to this report. For Rock and Roll Hall of Fame week, the night started off with just the right superstar talking points: Paul McCartney, Jimi Hendrix, Janis Joplin, Elton John, James Brown… Will.I.Am? Errrkay. The week’s co-mentor is a Jimmy Iovine crony — and a serious hitmaker in his own right — much like Gwen Stefani, who styled the Top 9 in her own L.A.M.B. line (it must be said: did Gwen also dress Randy Jackson, or is he auditioning for a spot in the Black Eyed Peas?) Neither was seen in the studio audience, according to our own Shirley Halperin, but Todd Rungren was along with Christian Slater (more on him later), pimping his new Fox show Breaking In. Also spotted in the house: Season 8 finalist Scott MacIntyre and his fiancée Christina Teich, who canoodled every chance they got. Up first was Jacob Lusk, who said that he changed his song from “Let’s Get It On” to “Man in the Mirror” because his moral code prevents him from conveying that raunchy a message or something like that. Then, he threw down a challenge: if he ends up in the bottom 3 on Thursday night, then America “wasn’t ready to look at themselves in the mirror.” Ok, Jacob — way to triple dog dare the audience. We’ll see how that works out for you. Haley Reinhart probably has the best shot on a rock-and-roll-themed night, with that Janis Joplin growl on “Piece of My Heart. It was time that she embraced the Joplin comparison, but if you’ve never seen footage of the legendary singer, check out one of the greatest moments at Woodstock. Melissa Etheridge also absolutely KILLED it performing the same song at Woodstock 94 decades later. So Reinhart had big shoes to fill Wednesday night, and she had the rock look down decked in leather, but for some reason hiding her legs in pants (a bummer for Idol’s few male viewers, no doubt). Still, she brought it down with a bluesy finish that had Jennifer growling while speaking — it’s infectious! Jennifer said the competition was off to a strong start and Randy agreed, welcoming Haley back for the umpteenth time this season. Steven credits Janis with giving rock and roll “the voice in 1968,” and Haley brought it back. A mighty big compliment for what was by far Haley’s strongest performance, even if I still see her as Miley Cyrus’s long lost twin. For Casey Abrams to do “Every Little Thing She Does Is Magic” the same week the mighty Constantine Maroulis returns to the stage was a tall order. Even Jimmy warned him that he sounded too Vegas, so Casey changed his song as well, even deciding to bring out the upright bass. It turned out Creedence Clearwater Revival and John Fogerty’s vocal was a much better match for Casey. Though he’s still gritting his teeth when he sings, which puts me off every time, this was a fine performance. Randy told him that he made CCR proud, and proclaimed him a revolutionary for making the upright bass cool again. Steven called him a “true musician,” and Jennifer said she would pay top dollar to be in the front row, which is, of course, a fraction of what she pays for a pair of her Louboutin shoes. Lauren Alaina came next with Aretha Franklin’s “You Make Me Feel Like A Natural Woman” which had Christian Slater cheering in the audience. Lauren’s country spin holds up and is pleasant enough but I’ve heard it done better. Still, Jennifer called her amazing, and Randy wasn’t jumping up and down, but alluded to people in previous seasons (ahem, Kelly Clarkson) who sang the heck out of that song. Steven loved her voice and was borderline drooling over Lauren, telling her, “You came here an immature little girl. Now you’re a natural born woman.” Walk this way, Lauren. Walk this way. James Durbin also referenced a past Idol, channeling the Adam Lambert look on his slowed down version of The Beatles’ “While My Guitar Gently Weeps.” I understand James trying to turn in a more subtle performance a la Adam, but the song’s lower register threatens his pitch. He can’t help himself, though, and lets out a wail at the end. He even, yes, weeped. Jennifer and Randy loved his sensitive side, and advised him that chances like these advance careers. As for Steven, perhaps he needs a reminder that George Harrison was in the Beatles when he wrote that song. As promised, Pia Toscano took on Tina Turner’s “River Deep Mountain High.” I would have preferred “Proud Mary“ but that’s just me. Meanwhile, Gwen dressed her like a lamb. As in Mary Had a Little Lamb. I have to hand it to Pia, she is so in control of her vocals, it’s scary. She even used pyrotechnics, and actually moved around the stage. Christian Slater’s daughter also loves Pia, and I’m having trouble seeing my dreamboat from “Heathers” as a dad. Sigh… Jennifer told Pia how special she is and declared that her mission is to make Pia even greater. Randy was pleased that Pia can deliver an up-tempo song and I was loving Pia’s jewelry. Steven made another head-scratching quip: “There’s a million guys, in a million bars, having a million drinks about you tonight.” Again — what? He really is becoming the male version of Paula! Still looking for connection, Stefano Langone chose Percy Sledge’s “When A Man Loves a Woman.” Coached by Will.I.am and Ryan Tedder, they tried their best to get him to be more Percy and less Michael Bolton. Stefano kept his eyes open, used his sweet falsetto, and engaged in a way we haven’t seen yet, but he was nearly wheezing towards the end and I still felt like I was on a cruise ship (Simon Cowell, come back!). Jennifer was, of course, super proud of him, and cried out “Baby, baby, I knew you had it in you!” But Randy wasn’t feeling it, instructing Stefano to let the song marinate. So Idol is now a cooking show. Idol’s “imperfect boy” and Vote For The Worst’s love child Paul McDonald considered toning down Johnny Cash’s “Folsom Prison Blues,” but Will.i.am and Jimmy disagreed, advising him to do all kinds of crazy things, like drink his own spit and get all “method” with his hair. It’s unclear whether Paul listened, but he nevertheless redeemed himself with impressive energy, nearly attacking the guitarist with some crazed dance moves. It’s a barn burner, y’all! Randy gave him three words, “I loved it,” and Jennifer said the performance was right in Paul’s lane. It all led to a raucous end to the show as the contestants boogied through the credits, but was it enough to erase the stench Paul left on stage last week? Bottom 3 this week? I call Jacob (because he dared me), Stefano, and a toss up between Paul and Lauren. What say you, Idol Worshipers? A somber Prime Minister Naoto Kan sounded a pessimistic note at a briefing hours after nuclear safety officials announced what could be a major setback in the urgent mission to stop the plant from leaking radiation, two weeks after a devastating earthquake and tsunami disabled it. The uncertain situation halted work at the nuclear complex, where dozens had been trying feverishly to stop the overheated plant from leaking dangerous radiation. The plant has leaked some low levels of radiation, but a breach could mean a much larger release of contaminants. The possible breach in Unit 3 might be a crack or a hole in the stainless steel chamber of the reactor core or in the spent fuel pool that’s lined with several feet of reinforced concrete. The temperature and pressure inside the core, which holds the fuel rods, remained stable and was far lower than would further melt the core. Suspicions of a possible breach were raised when two workers waded into water 10,000 times more radioactive than levels normally found in water in or around a reactor and suffered skin burns, the Nuclear and Industrial Safety Agency said. Kan apologized to farmers and business owners for the toll the radiation has had on their livelihoods: Several countries have halted some food imports from areas near the plant after milk and produce were found to contain elevated levels of radiation. He also thanked utility workers, firefighters and military personnel for “risking their lives” to cool the overheated facility. The alarm Friday comes two weeks to the day since the magnitude-9 quake triggered a tsunami that enveloped cities along the northeastern coast and knocked out the Fukushima reactor’s cooling systems. Police said the official death toll jumped past 10,000 on Friday. With the cleanup and recovery operations continuing and more than 17,400 listed as missing, the final number of dead was expected to surpass 18,000. The nuclear crisis has compounded the challenges faced by a nation already saddled with a humanitarian disaster. Much of the frigid northeast remains a scene of despair and devastation, with Japan struggling to feed and house hundreds of thousands of homeless survivors, clear away debris and bury the dead. A breach could mean a leak has been seeping for days, likely since the hydrogen explosion at Unit 3 on March 14. It’s not clear if any of the contaminated water has run into the ground. Radiation readings for the air were not yet available for Friday, but detections in recent days have shown no significant spike. But elevated levels of radiation have already turned up in raw milk, seawater and 11 kinds of vegetables, including broccoli, cauliflower and turnips. Tap water in several areas of Japan — including Tokyo — also showed radiation levels considered unsafe for infants, who are particularly vulnerable to cancer-causing radioactive iodine, officials said. The scare caused a run on bottled water in the capital, and Tokyo municipal officials are distributing it to families with babies. Previous radioactive emissions have come from intentional efforts to vent small amounts of steam through valves to prevent the core from bursting. However, releases from a breach could allow uncontrolled quantities of radioactive contaminants to escape into the surrounding ground or air. Government spokesman Yukio Edano said “safety measures may not be adequate” and warned that may contribute to rising anxiety among people about how the disaster is being managed. “We have to make sure that safety is secured for the people working in that area. We truly believe that is incumbent upon us,” the chief Cabinet secretary told reporters. Edano said people living 12 to 20 miles (20 to 30 kilometers) from the plant should still be safe from the radiation as long as they stay indoors. But since supplies are not being delivered to the area fast enough, he said it may be better for residents in the area to voluntarily evacuate to places with better facilities. “If the current situation is protracted and worsens, then we will not deny the possibility of (mandatory) evacuation,” he said. NISA spokesman Hidehiko Nishiyama said later that plant operator Tokyo Electric Power Co. was issued a “very strong warning” for safety violations and that a thorough review would be conducted once the situation stabilizes. Meanwhile, damage to factories was taking its toll on the world’s third-largest economy and creating a ripple effect felt worldwide. Nissan Motor Co. said it may move part of its engine production line to the United States because of damage to a plant. The quake and tsunami are emerging as the world’s most expensive natural disasters on record, wreaking up to $310 billion in damages, the government said. At Sendai’s port, brand new Toyota cars lay crushed in piles. At the airport, flooded by the tsunami on March 11, U.S. Marines used bulldozers and shovels to shift wrecked cars that lay scattered like discarded toys. Still, there were examples of resilience, patience and fortitude across the region. In Soma, a hard-hit town along the Fukushima prefecture coast, rubble covered the block where Hiroshi Suzuki’s home once stood. He watched as soldiers dug into mounds of timber had been neighbors’ homes in search of bodies. Just three bodies have been pulled out. “I never expected to have to live through anything like this,” he said mournfully. Suzuki is one of Soma’s lucky residents, but the tsunami washed away the shop where he sold fish and seaweed. “My business is gone. I don’t think I will ever be able to recover,” said Suzuki, 59. Still, he managed to find a bright side. “The one good thing is the way everyone is pulling together and helping each other. No one is stealing or looting,” he said. Alabaster reported from Onagawa. Associated Press writers Elaine Kurtenbach, Tomoko A. Hosaka, Kristen Gelineau, Jean H. Lee and Jeff Donn in Tokyo, Eric Talmadge in Soma and Johnson Lai in Sendai contributed to this report. BERLIN – A U.S. fighter jet crashed in Libya after an apparent equipment malfunction but both crewmembers were able to eject and were back in American hands with only minor injuries, U.S. officials said Tuesday. The F-15E Strike Eagle jet was conducting a mission Monday night against Libyan leader Moammar Gadhafi’s air defenses when it crashed at 2130 GMT (5:30 p.m. EDT), said Lt. Cmdr. Karin Burzynski, a spokeswoman for the U.S. Africa Command. A spokesman for the Libyan opposition, Mohammed Ali, said the U.S. plane went down about 25 miles (40 kilometers) outside of the eastern rebel stronghold of Benghazi, Libya’s second-largest city. 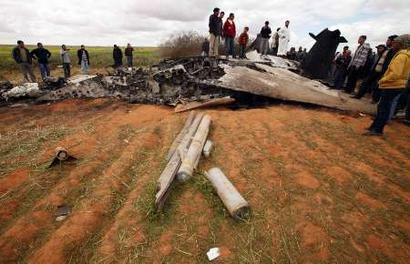 Britain’s Telegraph newspaper published a series of photographs it said was the wreckage of the plane, showing people milling around the burned-out aircraft in a Libyan field. One of the jet’s airmen landed in a field of sheep after ejecting from the plane, then raised his hands and called out “OK, OK” to a crowd who had gathered, the Telegraph cited witness Younis Amruni, 27, as saying. “I hugged him and said: ‘Don’t be scared, we are your friends,'” Amruni told the newspaper, adding that people then lined up to shake the airman’s hand. A Marine Corps Osprey search and rescue aircraft retrieved the main pilot, while the second crew member, a weapon systems officer who is also a pilot, was recovered by rebel forces and is now in American hands, a U.S. official said in Washington. He spoke on condition of anonymity because he was not authorized to speak on the record. Amruni said the Osprey fired shots to keep locals away, then swooped in and rescued the second crew member. The two were separated after ejecting from the crippled jet at high altitude and drifting down to different locations, Africa Command spokesman Vince Crawley said, adding they sustained minor injuries. The aircraft, based out of Royal Air Force Lakenheath, England, was flying out of Italy’s Aviano Air Base in support of Operation Odyssey Dawn. The cause of the crash is being investigated. The Air Force has said only that B-2, F-15 and F-16 fighters are participating in operations over Libya. The U.S. involvement in Libya is being run by Africa Command, which is based in Stuttgart, Germany. The air campaign by U.S. and European militaries that began Saturday has rearranged the map in Libya and rescued rebels from what had appeared to be imminent defeat. On Monday night, Libyan state TV said a new round of strikes had begun in the capital, Tripoli, marking the third night of bombardment. But while the airstrikes can stop Gadhafi’s troops from attacking rebel cities — in line with the U.N. mandate to protect civilians — the United States, at least, has appeared deeply reluctant to go beyond that toward actively helping the rebel cause to oust the Libyan leader. Pauline Jelinek in Washington, Cassandra Vinograd in London and Maggie Michael in Cairo contributed to this report. The ongoing crisis at Japan’s Fukushima Daiichi nuclear plant has turned into what one analyst calls “a slow-moving nightmare,” with fires, leaks of poisonous radiation, and mass evacuations. What’s at the root of the problem? Friday’s earthquake and tsunami caused power outages across northern Japan — including at the Daiichi plant, which comprises six separate reactors. That in turn caused a failure of the reactors’ cooling systems, which are needed to keep the nuclear fuel from overheating and melting down and/or triggering an explosion, releasing poisonous radiation into the atmosphere. What’s the current situation at the plant? Yesterday, an explosion caused the containment vessel covering the Number 2 reactor to crack, releasing into the air a surge of radiation 800 times more intense than the recommended hourly exposure limit in Japan. One third of the fuel rods at the reactor were reportedly damaged. In addition, another powerful explosion blew a 26-foot wide hole in the side of Number 4 reactor, causing fires to break out and a pool containing spent fuel rods to begin dangerously overheating. The Japanese military tried to use helicopters to dump water from the air to cool the Number 4 reactor, but that plan was abandoned after a third explosion — this one damaging the roof and cooling system of the Number 3 reactor — because it would have meant flying a helicopter into radioactive steam. Gregory Jaczko, the top U.S. nuclear official, said today that all the water was gone from the pool containing the fuel rods at the Number 4 reactor — an assertion denied by a spokesman for the Japanese power company that runs the plant. If Jaczko is correct, it would mean there is nothing to stop the fuel from melting down, spewing radiation. Water was also poured into the Numbers 5 and 6 reactors, suggesting that essentially the entire plant could be at risk of overheating. In what appears to have been an understatement, the plant operator described the situation at the Number 4 reactor as “not so good.” But in some ways the rupture at the Number 3 reactor is especially troubling, because it’s the only reactor that uses plutonium as part of its fuel mix. If absorbed into the bloodstream, plutonium can stay in the liver or bone marrow and cause cancer. Japanese officials said early Thursday they’re close to completing a new power line which would restore the cooling systems for the reactors, but it’s unclear when the line will be up and running. How much of the surrounding area is likely to be affected by the radiation? The government has told the roughly 140,000 people who live within 18 miles of the plant to stay indoors, but has said that people outside that zone can safely go outside. However, some experts have accused the Japanese authorities of underplaying the severity of the crisis. The U.S. embassy has recommended that Americans within 50 miles of the plant evacuate the area or stay indoors. 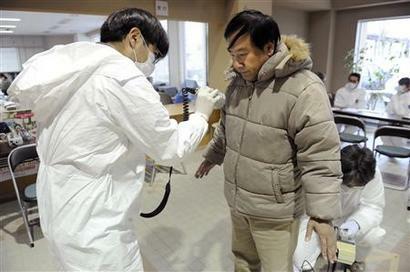 Tokyo, 180 miles south of the plant, has recorded radiation levels only slightly above normal. Still, both France and Australia have urged their nationals throughout the country to leave, and many Tokyo residents have been staying indoors. One American couple living in Tokyo told family they don’t yet see a need to leave, but are monitoring the situation closely. What other ideas are being considered? In what experts describe as a last-ditch effort, police are hoping to use a water cannon — usually used to quell riots — to cool the nuclear fuel. Officials have also proposed using boric acid, which can help slow nuclear reactions by absorbing neutrons. On Monday, 750 workers were withdrawn from the facility, leaving a core of 50 to battle the crisis alone while exposing themselves to potentially deadly levels of radiation. But even those workers appeared to have been withdrawn today after a surge in radiation caused by new explosions made the area too dangerous. What are the best- and worst-case scenarios? The best case scenario is that efforts to cool the fuel rods succeed, and damage to the surrounding environment is limited to an area within about 15 miles of the plant. The worst is a full-scale meltdown of the reactors caused by overheating, which would release much larger amounts of radiation into the air than has yet occurred. In that case, the damage could potentially approach the level of the Soviet Union’s 1986 Chernobyl disaster, for which estimates of deaths vary from 4000 to close to one million. How does the crisis rank, in terms of nuclear plant accidents? On Saturday, Japanese authorities ranked the incident a Level Four on a one-to-seven scale used to rank nuclear accidents. but things have worsened since then, and yesterday France’s nuclear authority said it should be classified as a Level Six. Chernobyl is the only Level 7 accident ever to have occurred.